This paper presents an extensive evaluation of digital soil mapping (DSM) tools. Recently, large sets of environmental covariates (e.g. from analysis of terrain on multiple scales) have become more common for DSM. Many DSM studies, however, only compared DSM methods using less than 30 covariates or tested approaches on few responses. We built DSM models from 300–500 covariates using six approaches that are either popular in DSM or promising for large covariate sets. We investigated how the composition of bone char (BC) particles altered in soil and affected the soil P speciation by fractionation and X-ray absorption near-edge structure spectroscopy. Bone char particles (BC from pyrolysis of bone chips and BCplus, a BC enriched with S compounds) were collected at the end of incubation-leaching and ryegrass cultivation trials. Soil amendment with BCplus led to elevated P concentrations and maintained more soluble P species than BC even after ryegrass growth. Subsoil compaction is an important soil threat. It is caused by heavy machines used in agriculture. The aim of this study was to estimate how large the area with overcompacted subsoils is in the Netherlands. This was done by selecting locations randomly and determining the porosity and bulk density of the soil at these locations. It appeared that 43 % of the soils in the Netherlands is overcompacted, and so we conclude that subsoil compaction is indeed a serious problem in the Netherlands. Soil degradation is a major threat for farmers of semi-arid north-central Namibia. Having tools to assess soil quality is important to evaluate soil conditions and helps targeting important issues. We developed a soil evaluation toolbox that integrates farmers' field experiences and technical knowledge. The combination of local soil descriptions, field soil texture evaluation and soil colour provides locally meaningful information that reveals soil quality improvement potentials. Lab experiments were performed to understand solute transport in peat from an experimental fen. Transport was analyzed under saturated and unsaturated conditions using NaCl (salt). We tested the applicability of a physical-based model which finds a wide consensus vs. alternative models. Evidence indicated that Cl transport can be explained using a simple transport model. Hence, use of the physical transport mechanism in peat should be evidence based and not automatically assumed. 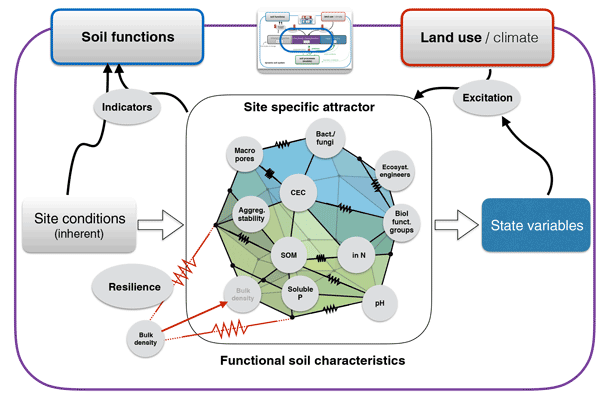 This paper deals with the importance of soil for our terrestrial environment and the need to predict the impact of soil management on the multitude of functions that soil provides. We suggest to consider soil as a self-organized complex system and provide a concept of how this could be achieved. This includes how soil research, currently fragmented into a number of more or less disjunct disciplines, may be integrated to substantially contribute to a science-based evaluation of soil functions.